Copyright law regulates creativity. It affects the way people create works of authorship ex-ante and affects the status of works of authorship significantly ex-post. But does copyright law really understand creativity? Should legal theories alone inform our regulation of the creative process? This book views copyright law as a law of creativity. It asks whether copyright law understands authorship as other creativity studies fields do. It considers whether copyright law should incorporate non-legal theories, and if so, how it should be adjusted in their light. For this purpose, the book focuses on one of the many rights that copyright law regulates – the right to make a derivative work. A work is considered derivative when it is based on one or more preexisting works. Today, the owner of a work of authorship has the exclusive right to make derivative works based on her original work or to allow others to do so. The book suggests a new way to think about both the right, the tension, and copyright law at large. It proposes relying on non-legal fields like cognitive psychology and genre theories, and offers new legal-theoretical justifications for the right to make derivative works. As the first book to consider the intersection between copyright law, creativity and derivative works, this will be a valuable resource for students, scholars, and practitioners interested in intellectual property and copyright law. "From mashups to fan fiction, the digital age has been a wellspring of creativity that builds on copyrighted works. 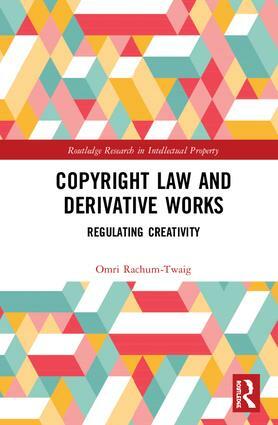 Drawing on insights from cognitive psychology and creativity studies, Omri Rachum-Twaig articulates a provocative new theory for understanding the rationale for, proper scope of, and remedial framework for copyright law's right to prepare derivative works. Such fundamental rethinking of how society can best promote cumulative creativity deserves serious attention." "Copyright Law and Derivative Works offers a novel account of the nature, justification and scope of the derivative work right in copyright law in light of insights about the essence of creativity culled from cognitive psychology and genre theory, thus richly evoking the variegated junctures between critical analysis of copyright doctrine, creativity theory, and the relation between extra-legal theory and specifically legal theory and practice. Worthwhile reading for anyone engaged with copyright law, its justification, and its place and role in broader social and theoretical concerns." Non-legal Aspects of Creativity – What is the Significance of Using Prior Knowledge? The Legal World – What is the Scope of the Derivative Works Right and is it Justifiable? Omri Rachum-Twaig is adjunct professor of law at the Faculty of Law, Tel Aviv University, Israel. He teaches and writes about copyright, cyber and information law, artificial intelligence and emerging technologies. He has published on all these matters in leading law reviews and journals, has won several academic awards and prizes, and his work is frequently cited in scholarly work and courts, including the Supreme Court of Israel.